This month, I had an ambitious plan in mind for my nails. Unfortunately, however, it didn't work out so instead I settled on this gorgeous periwinkle shade from OPI, named You're Such a Budapest. Although it applied a little thinly, it's a really pretty colour. 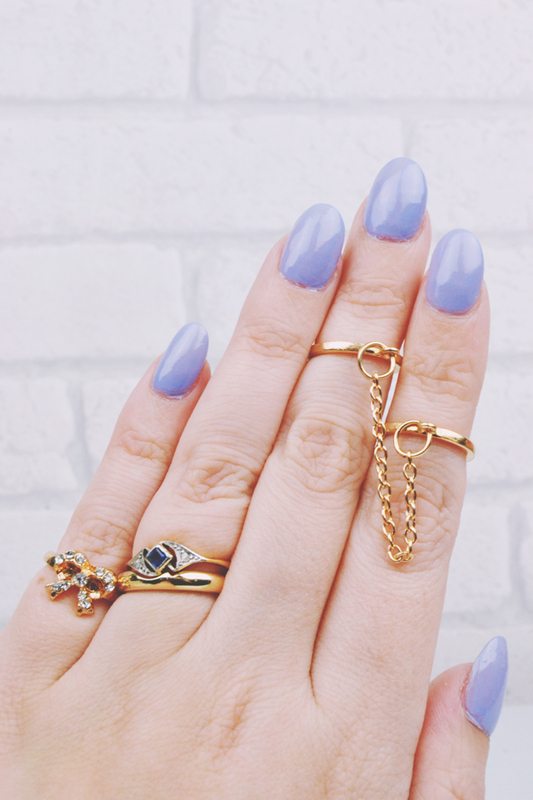 As you can see, I'm trying to wear more jewellery so I hunted down these midi rings on eBay. It's taking some getting used to but I am determined to accessorise more! Preeeetty rings! And nail colour! That nail colour is so cute, love. That two finger ring is a beaut, great selection of rings. Lovely colour...I really like those midi-ring things, very pretty indeed. Ahh getting very excited to see this photo as its so pretty! Love the nails and the rings so much! Fab colour choice for Spring.